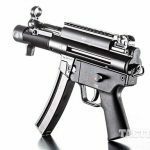 For those of you who love Heckler & Koch’s renowned roller-delayed weapons but never got a chance to own one, the new semi-auto SP5K pistol handles like an MP5 subgun without any of the select-fire restrictions. Dimples on the barrel shround serve as rests for your support-hand thumb. Also note the bottom hand stop. 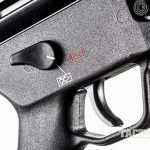 The SP5K’s safety is ambidextrous and has pictographic markings. You’ll probably need to use your support hand to hit the magazine release just behind the magazine well. The rotary rear sight has four different-width apertures for shooting at various distances. Also note the takedown pin behind the sight. Yes, the SP5K is quite a large handgun, but it’s still easy to conceal in something like this Hazard 4 Defense Courier messenger bag. 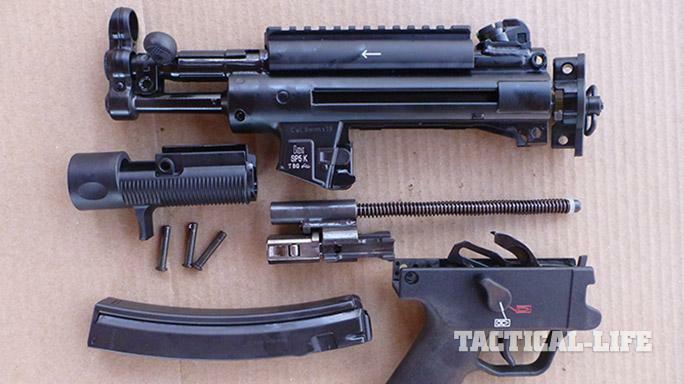 The front sight and charging handle carry on the MP5 tradition, though it’s one of the only HKs with a barrel shroud. 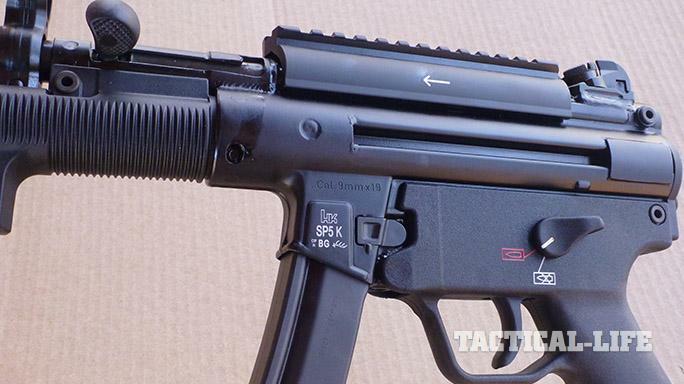 For greater versatilty, HK includes a removable Picatinny rail on top of the receiver. Just add a reflex sight. 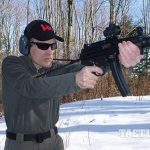 The sling helps stabilize the gun, but the muzzle rises much more than most pistols because the bore axis is high above the grip. Heckler & Koch’s roller-delayed weapons are among the most desirable firearms ever imported into the U.S. These genuine HKs—“legacy arms” in company lingo—came to our shores in quantity during the 1980s but are now somewhat scarce after an importation ban in the early 1990s. The SP89 pistol is among the rarest because it had a short production run from 1989 to 1994 before the Clinton administration banned its import by name. 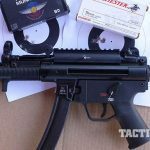 In its heyday, the SP89 was the closest one could get to owning a “civilian- legal” MP5K machine pistol, a gun that seems to hold a considerable cachet over other variants of the MP5. 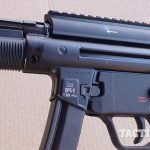 Now, decades later, HK is importing a modernized version of the SP89 under a new name with obvious hints to its origins: the SP5K. 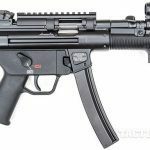 The SP5K should not be confused with semi-automatic imitations of the HK MP5K made by other companies, though comparisons between the two pistols are inevitable. 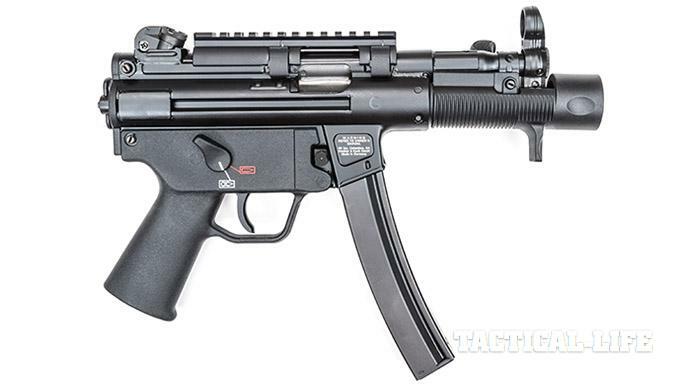 In my experience, the much higher priced HK SP5K remains the quality leader with a noticeably better fit and finish, barrel and trigger group compared to imported MP5K copies not made by Heckler & Koch. 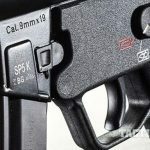 The SP5K also has an ambidextrous safety and an updated one-piece grip frame with pictographic markings, and it comes with a very durable waterproof case with a custom-fit interior, a rear sight adjustment tool and a sling. Dimensionally, the SP5K is compact and lighter than some other pistols in its class with an overall length of 13.9 inches, a height of 10.5 inches with a 30-round magazine and 8.7 inches without, and a weight of 4.2 pounds excluding the magazine. 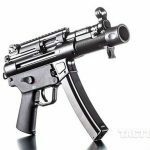 In contrast, the CZ Scorpion EVO 3 S1 Pistol is 16 inches long and 9.4 inches tall with a 20-round magazine, and 9mm AR-15 pistols are about 23 inches long with 7-inch barrels. 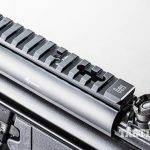 The SP5K’s receiver is made from two stamped-steel shells that are welded together and Parkerized before a powder-coat paint is applied. 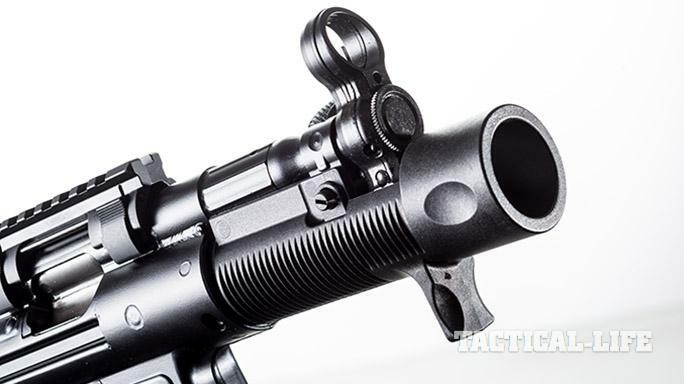 The 4.53-inch-long barrel is hammer forged with land-and-groove rifling and a plain muzzle. HK barrels are made with steel that is used in cannon barrels, and they are extremely durable, especially after undergoing hammer forging to impart the rifling. 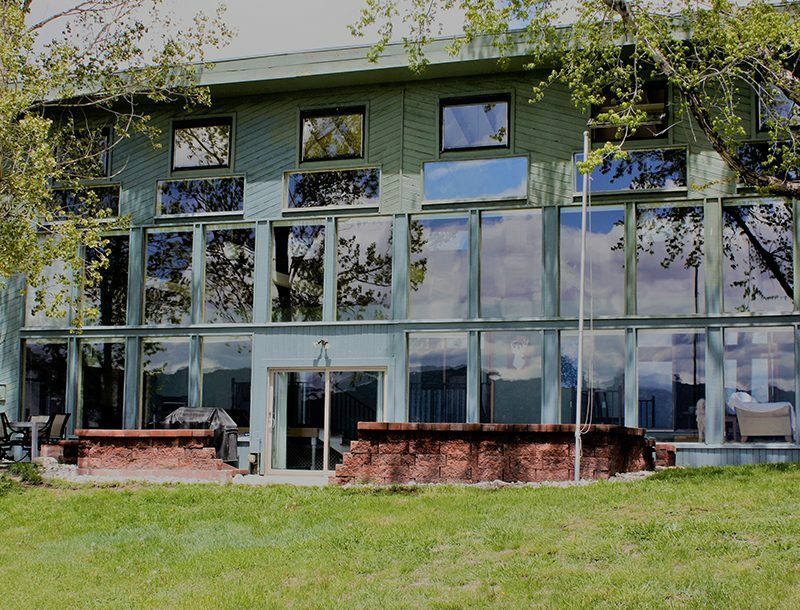 For improved extraction, the chamber has shallow groves milled into the walls that allow gas to break the fired and expanded shell case free from the chamber wall. 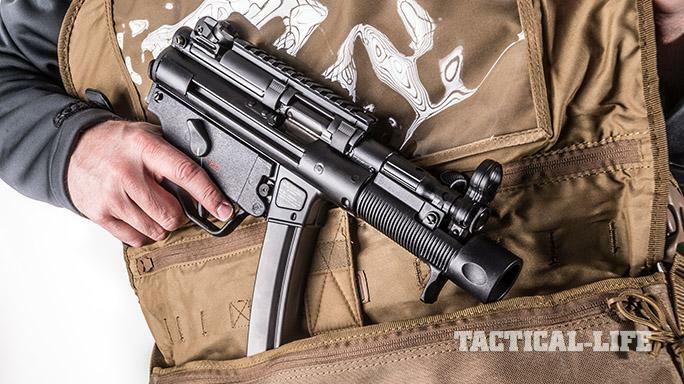 Unlike HK pistols that use polygonal rifling, you can use exposed-lead bullets in the SP5K. 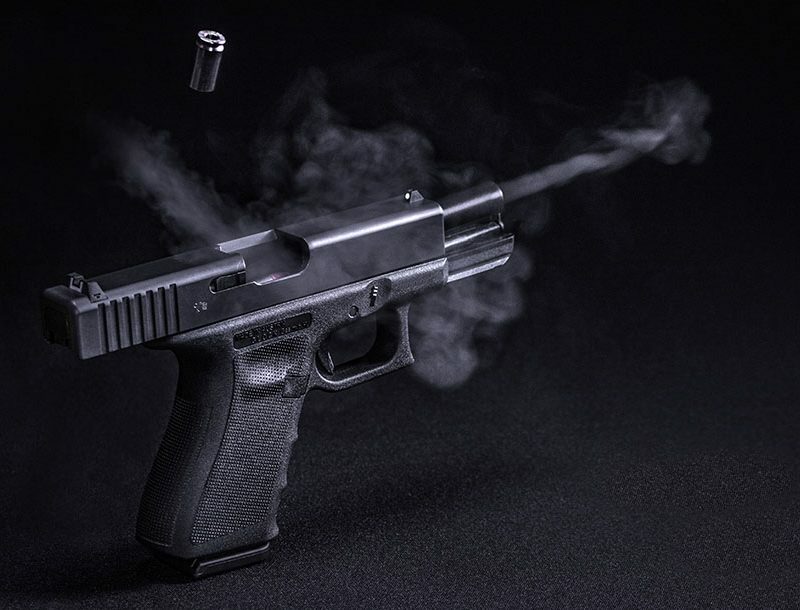 (Don’t use exposed-lead bullets in polygonal- or hexagonal-rifled barrels because lead can build up just in front of the chamber and increase pressure above normal.) This pistol’s operation is identical to the SP89 and doesn’t hold the bolt rearward after the last round is fired. 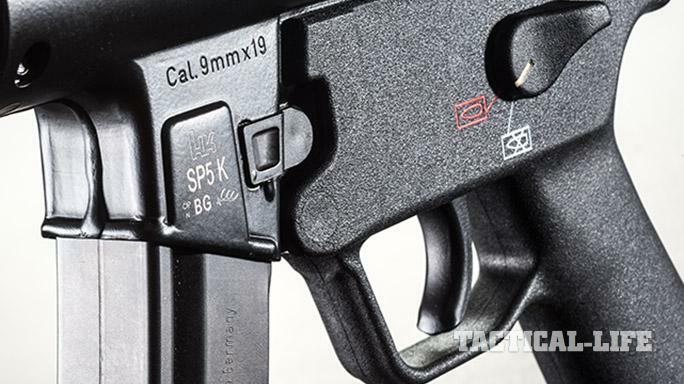 Although the SP5K is essentially a remake of the SP89, the two differ with respect to their trigger housings, trigger packs, safeties and handguards. 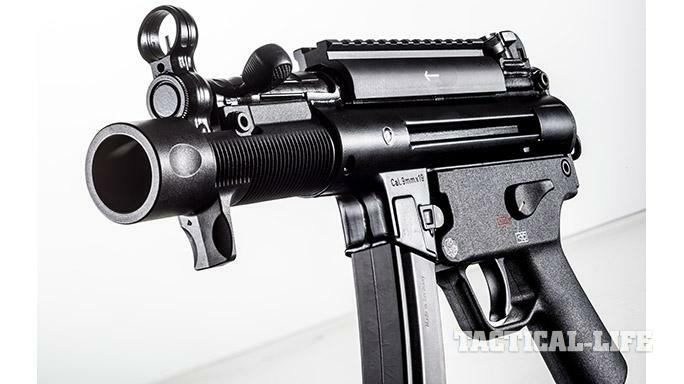 The new version also has a removable, receiver-mounted Picatinny rail for mounting optics while the SP89 could only be equipped with a claw-type mount. 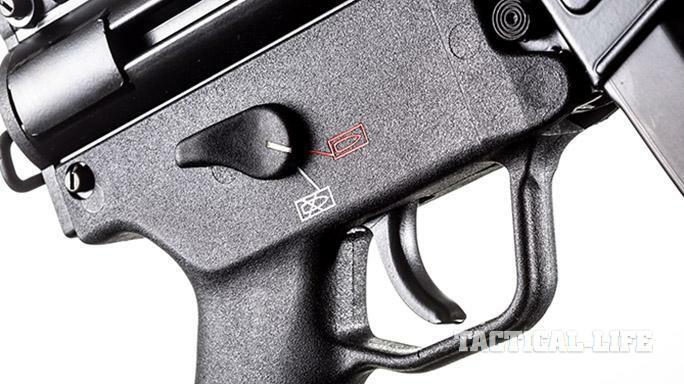 The SP5K has a more comfortably shaped trigger with a smoother trigger pull than the SP89. The specified pull weight is 6.74 to 10.11 pounds. Finally, the SP5K has a ribbed rather than flat handguard surface for a much better grasp than the older version. 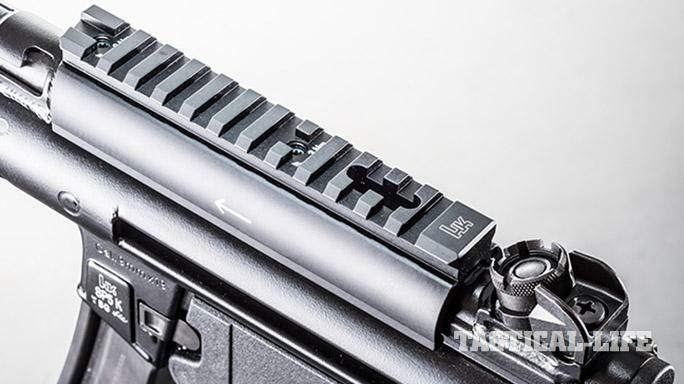 The handguard has a hand stop to keep your fingers away from the muzzle and a hollow cavity up front that recesses the muzzle by about 1.5 inches. 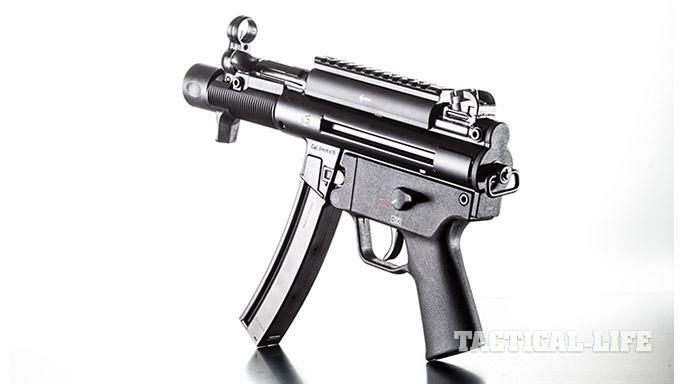 Some shooters may not find the form appealing, but be careful not to change this handguard to a vertical foregrip like the one used on the MP5K because this modification converts the pistol to an “Any Other Weapon,” or AOW, which requires NFA registration. 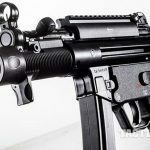 For shooters who don’t mind the added time, complication and tax, a much more useful conversion is to remake the SP5K into a short-barreled rifle (SBR) by adding a rear stock. 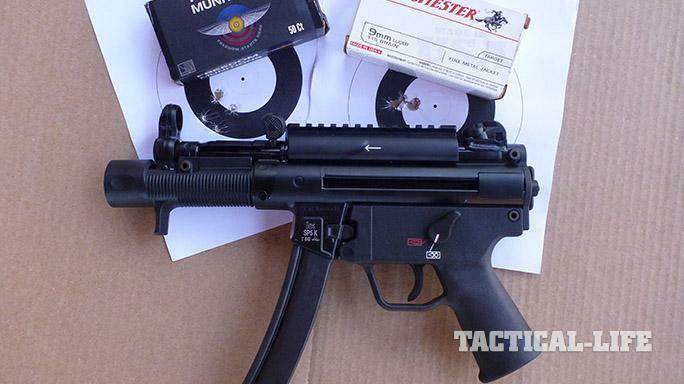 The same NFA approval and registration process of making an AOW applies, but the tax is $200. However, this modification gives the SP5K expanded capabilities because the shoulder stock affords a much steadier aim that will materially increase the weapon’s accurate range. Also, a vertical foregrip can be added to an SBR without any NFA issues. The SP5K’s sights consist of a diopter front and a rotating drum at the rear with four different-width sighting notches: small for precise aiming in good light or wide for rapid sight acquisitions or low-light firing. The windage can be adjusted by loosening a setscrew, then moving the drum sideways by turning another screw. The elevation can be changed by using a tool included with the pistol. 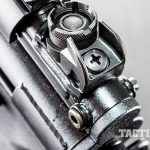 Weapons that use this mechanism have less weight and perceived recoil but are more complicated and costly to manufacture than those that use a simple blowback system. The lighter weight comes from not needing a heavy bolt to delay the action from opening after firing. A shooter feels less recoil because there’s less reciprocating mass in the bolt carrier group, and the delayed roller unlocking smooths out the recoil impulse. 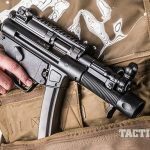 Along with a straight stock, this is why the MP5 is so controllable. Here’s how it works: When in battery, two small rollers mounted on either side of the bolt at the 3 and 9 o’clock positions are forced outward by the angled surfaces of the locking piece. The rollers fit into corresponding recesses in the barrel extension. When fired, the case walls expand against the chamber and exert rearward pressure against the bolt face. 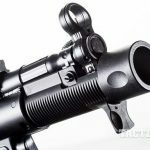 This rearward pressure causes the rollers to be driven inward against the tapered sides of the locking piece, which pushes the bolt carrier rearward, thus delaying the rearward travel of the bolt head. Though the system has fewer parts than it may sound, they need to be correctly made for this system to work reliably and safely. 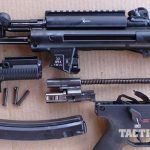 I can personally recall how many imitations of HK firearms s had poor reliability or were unsafe to fire precisely because the roller delay mechanism was incorrectly made or fitted. Legacy HK firearms are easily accessorized in a multitude of ways. Two that I found useful for the SP5K are the DSD holster from DeSantis and the Trijicon MRO reflex sight. I obtained the latter from Arms Unlimited. 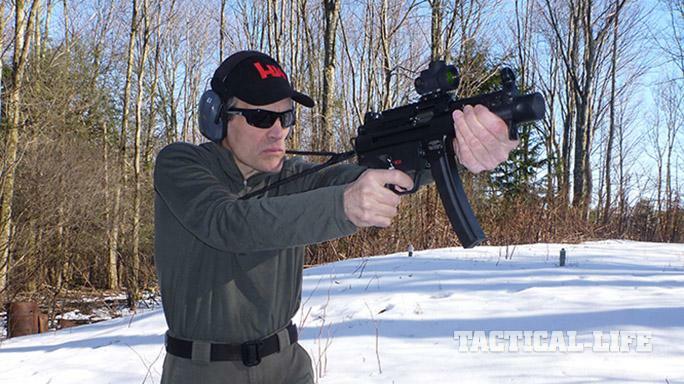 The DSD is a nylon rig that securely holds several types of submachine guns at your side under the arm, but it works best with folding-stock MP5s and its progeny. The SP5K is secured by a snap strap and/or a detachable tether cord with an HK-style clip that attaches to the receiver’s end cap swivel. The clip allows the weapon to be swung up and fired while still tethered or detached and deployed. Two 30-round magazine pouches are mounted under the opposing arm. When using the DSD, be sure to adjust the holster to fit your body and position the retention snap correctly if you install a paddle-style magazine release on your SP5K or it could activate inadvertently. To measure the SP5K’s accuracy at 25 yards, I fired the gun off a Caldwell rest using the supplied iron sights followed by off-hand shooting with and without the sling and Trijicon MRO sight. The Freedom Munitions and Winchester loads tied for creating the smallest five-shot groups at 0.94 inches. There were several instances of three to four shots in a tight 1-inch group with one or two flyers opening the group up. This pistol is sighted in at the factory to shoot to the point of aim at 25 meters, and it did not need any adjustments. 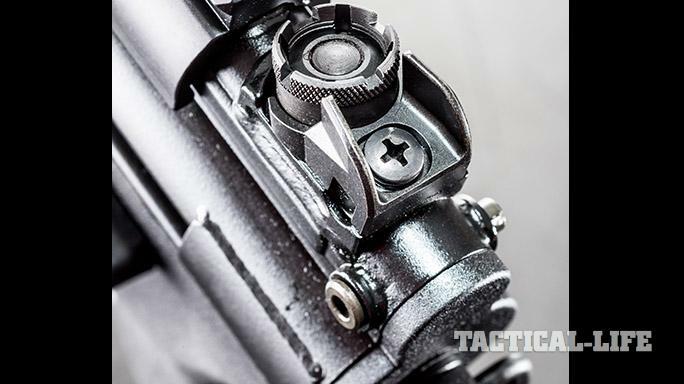 Shooting tight groups, however, would be easier and more consistent with a different trigger. My sample trigger weighed just under 8 pounds with nearly 0.38 inches of creep after the take-up stage. 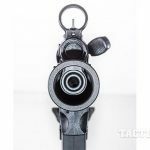 Offsetting the trigger are things that actually enhance the pistol’s accuracy, namely a fixed barrel, a 10.25-inch sight radius and decent, non-glare sights. The SP5K was reliable except for two failures to eject using the Freedom Munitions load. For those who reload, this pistol did not dent case mouths while ejecting like many HK imitations do. The SP5K’s ambidextrous safety can be placed in the “fire” positon using your thumb, but its shape does not allow you to place the gun on “safe” without significantly adjusting your grip. I found that sliding my support-hand thumb rearward to activate the safety worked well. 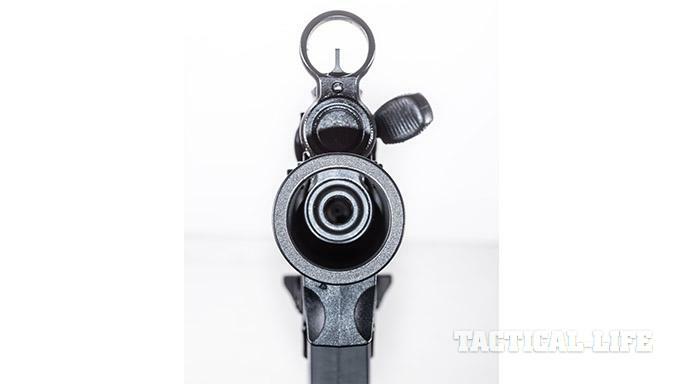 Shooting unconventionally built pistols where the magazine and weight are way in front of the grip requires some experimentation. Most methods of firing the SP5K become steadier when using the sling correctly by wrapping it around the left shoulder and under the right arm. The sling works best when adjusted to make it tight when extending the arms fully forward against the cord’s elastic tension. Mounting a red-dot sight, however, gives you more choices in your firing stance because the sights can be brought close to the face without making the target and peripheral view extremely blurry. That is what happens when bringing iron sights close to your eyes. The method shown in the manual is to grasp the barrel shroud with the support hand and align the thumb onto a dimple in the shroud. This technique is steadier if the support hand presses forward against the hand stop while your firing hand pulls rearward. Another method is to grasp the front of the magazine well with the support hand and brace the left thumb against the charging handle. 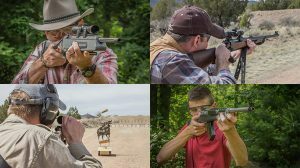 This technique limits muzzle rise, but be mindful not to push against the cocking handle or your shots will go low. Using a standard overlapping-hands grip and holding the SP5K at arms’ length worked well with the sling, and I could align the sights quickly and easily. 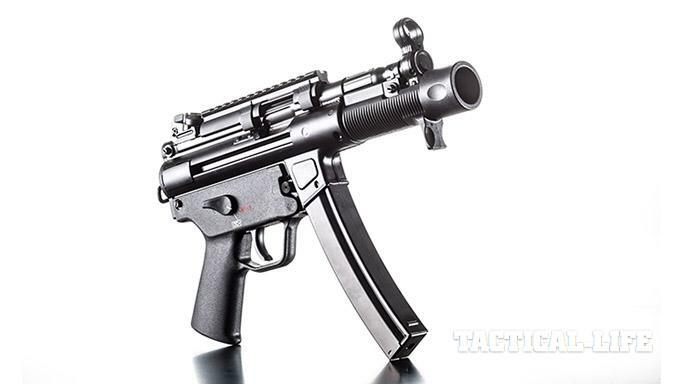 The SP5K is a well-made and authentic Heckler & Koch pistol with lots of collector and shooter appeal. I often hope that semi-automatic versions of machine pistols like the SP5K will eventually get a special class in IPSC or 3-Gun competition so man and machine can be put to the test shooting these somewhat challenging pistols in live-fire scenarios. Competitions would lead to better shooting techniques using these types of pistols, more varied equipment and a demonstration of the positive aspects of this often illogically maligned breed of handgun. And that would be something to look forward to.